Working the sheep always works up an appetite—for everybody involved. 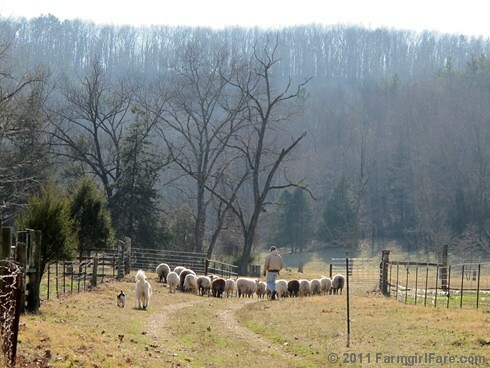 © FarmgirlFare.com, where everybody's happy we still have a little fresh grass in the fields. The season of eating all hay, all day will be here soon enough! Stunning photo Susan. How nice to see Bert on duty with Daisy, Joe, and the Sheep.. Bear and Marta are on break? I am surprised they would miss out on this. BTW, I loved that blurry,flying through the air, action shot of Bert with Bear too! What a great series that was.